Many Californians are accustomed to driving their vehicles on a daily basis. Although it may appear that driving has become a right to all eligible citizens, the fact remains that a license to drive is a privilege granted by the state of California. One of the easiest ways to ensure that your license to drive will remain secure is to become informed. After reading this article, you will learn the many different actions that can result in loss of your driving privilege. This is the second in a series of three articles on this topic. Violation points are assigned to Vehicle Code sections involving the safe operation of a motor vehicle. If you accumulate too many points, the DMV may suspend, revoke, or place your driving privileges on probation. For instance, if you accumulate 4 points in 12 months, 6 points in 24 months, or 8 points in 36 months, your driver license may be suspended. Before you appear in court you need to make sure that pleading guilty to a traffic ticket will not lead to your license being suspended. If you are convicted of racing or reckless driving, a court may suspend your driver license for up to 30 days for a first conviction, up to 60 days for a second conviction, and up to six months for three or more convictions. Additionally, if you are convicted of driving over 100 m.p.h. a court may suspend your driver license for up to 30 days. A court may suspend your driver license for up to 30 days if you are convicted of disorderly conduct within 1,000 feet of a private residence. A court may suspend your license for up to 30 days if a peace officer sees you hire a prostitute and engage in a lewd act within 1,000 feet of a private residence in a vehicle. If while using your vehicle you assault an operator or passenger of another motor vehicle, bicycle, or assault a pedestrian, a court may suspend your driver license for six months for a first offense and one year for any subsequent offense. The DMV will revoke your driver license if you are convicted of any felony involving the use of a motor vehicle. If you are convicted of assault with a deadly weapon and the vehicle is found by the court to constitute the deadly weapon, your license will be revoked forever. If you are either a part of a public entity or a towing company and are convicted of a conflict of interest, the DMV will suspend your driver license for four months for the first conviction and one year for any subsequent conviction. If you are found guilty of the theft or other unlawful taking of a vehicle, the DMV will suspend or revoke your driver license. The DMV may suspend or revoke your driver license upon any of the grounds which would have made you ineligible to receive your license. These grounds include episodes of loss of consciousness or seizures. If a doctor becomes aware of such a condition, he or she is under an ethical duty to report the condition to the DMV. The DMV may require the surrender of a driver license that was issued to you erroneously or which contains any erroneous or false statements. If you do not surrender the license, the DMV may suspend your license until the license is corrected. If you write a check to the DMV which bounces your driver license will be suspended. If you violate a promise to appear in court, the DMV will suspend your driver license. The DMV will suspend your driver license if you willfully fail to comply with a court order. This includes court ordered child support payments. The DMV will suspend your license until you comply with the court order. If you knowingly present false evidence of insurance to either a peace officer or a court, the DMV will suspend your driver license for one year. b) Reckless driving causing bodily injury c) Failure to stop at a railway crossing d) Evading a police officer e) Knowingly participate in a vehicular collision for the purpose of insurance fraud. The most important thing you can do after being cited and/or arrested is immediately go to www.wklawdmv.com and read about how Wallin & Klarich can help you avoid the suspension or revocation of your license, stay out of jail and avoid a large fine. You will need to do your homework quickly in order to help Wallin & Klarich win your case. You have the right to have a DMV hearing to contest the potential suspension or revocation of your license, and, if successful, have the DMV action set aside. You also have the right to be represented by an attorney at that hearing. 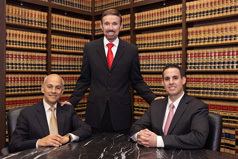 Wallin & Klarich has been handling DMV hearings throughout Southern California for 30 years. We strongly suggest you print this document out and keep it somewhere where you can refer to it if you or a loved one is cited or arrested for a vehicle violation. Please make sure you forward this to everyone you care about so they know their legal rights. Please remember if you are arrested your first call should be to your lawyers at Wallin & Klarich at 877-466-5245. Can I Have an Attorney Represent Me at My DMV Hearing in California After I was Arrested for DUI?